The property crisis continues, with Manchester one of the cities that stands to be most severely affected (along with Liverpool, Leeds and Sheffield), in part due to over-supply. And it seems to me that many of the ‘luxury’ apartments in the city centre are anything but. As I took this shot of a less-than-convincing ‘luxury’ development at the top of Chester Street near the BBC, a woman was burning something (a bra?) on one of the balconies above. A prank I suppose, but a clue to the kind of neighbours you’ll end up with (I mean idiots rather than feminists!). It didn’t make me want to buy an apartment. The Green Building, ‘a pioneering eco-friendly housing project, almost unique in the UK’ has ‘public transport links… in abundance’. It certainly does: it is literally yards from the railway viaduct leading in and out of Oxford Road Station — the main Manchester to Liverpool line. Though, strangely, the railway viaduct seems to have disappeared from the ‘artist’s impression’ images on this estate agent’s website and the map falsely shows the location of The Green Building as being on the corner of Chester Street and Cambridge Street. It isn’t there, as you can see if you switch the map to satellite view. The building is actually 600ft north of the marked spot, next to the railway line. See here on Google Maps, in the centre of the map, on New Wakefield Street. The trains start at 04.49 hours and finish at 23.27. So, if you’re unlucky enough to be on the side facing the station, one will pass your window about every 10 minutes, 19 hours a day, 364 days a year. I hear there are no baths in the residences (too environmentally unfriendly you see), showers only, and there’s no parking. Well, I guess you can’t expect TOO much for ‘just’ £449,950 ($900,000). The building also overlooks this waste ground at the rear. Across the road is the former Dunlop rubber factory. Peeking through the fence you can see how much of this historic site has been demolished in the conversion into apartments. Compare the shot above (taken in April 2008) to the earlier shots on this site. Work is still in progress here and maybe it will look a whole lot better a year from now? Or perhaps not… I’m struck by how many city centre developments are surrounded by wasteland. Even in areas that were ‘regenerated’ more ten years ago. 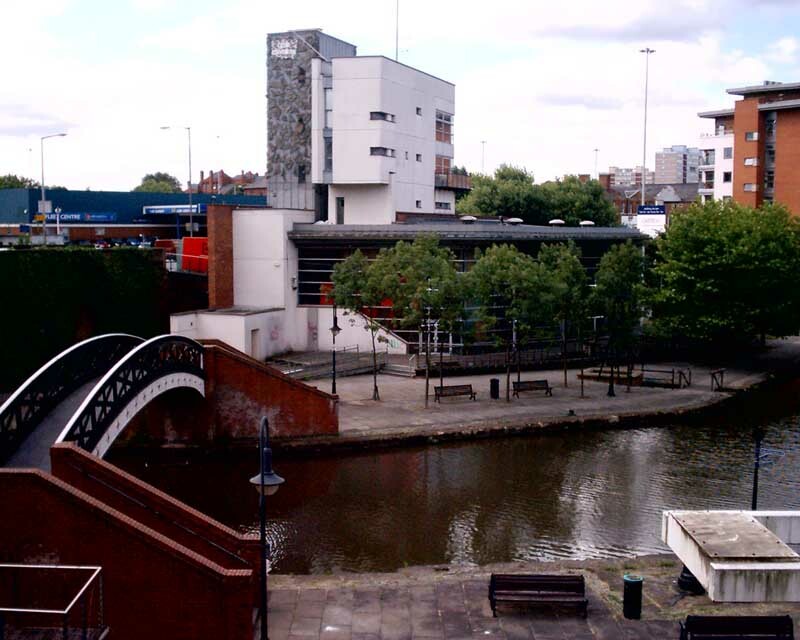 An example is this site over at Castlefield. No doubt when people bought, they thought it would only be a matter of time before these patches were developed? But what happens now, as many developers mothball and delay projects? Suddenly, views like this could be a liability and a blight on your property for years to come. And it’s not just those spots here and there that never were regenerated. Castlefield is beginning to have a run-down and rather bleak feel to it and the people who live there are concerned. Bridges over the canal have peeling paint and patches of rust. One of the mills that used to house businesses appears to be empty and there’s a derelict pub that closed in 2003. The pub highlights another problem with buying in an unfinished area: you’re never quite sure what devious property developers might do. Residents are fighting a plan to build an oversized box-like apartment block on the site of the pub. Mind you, these days, it can’t have been much fun living opposite a pub either? It’s a myth that all new-build city centre apartments are inhabited by the wealthy. Many are buy-to-let properties that are rented out. Distant owners aren’t so in touch with the surrounding area and some probably don’t care. I’m convinced that those apartment blocks that are poky inside and poorly constructed (and architects and others have expressed concern at the number that are) will turn out to be the slums of the 2030’s and 2040’s. And I wouldn’t count on the city council to tidy up messy spots and derelict areas that remain undeveloped. The council seems to lack the will, ability and maybe resources to create streets and spaces that look good and stay that way. Bye bye flowers in Parsonage Gardens, Manchester city centre. Photo date: August 2008. Even the city’s parks look unloved. The council is busy removing flower beds from Parsonage Gardens in the city centre and replacing them with grass while, further out, the likes of Whitworth Park in Rusholme are a real disgrace. I can’t quite understand how we can have had a decade of ‘boom’, a massive rise in city centre living (and corresponding increase in council tax income), yet the council is unable to keep parks up to the standard they were in the poverty-stricken 1930’s and post-war years. I totally agree with the author of this article, and for my part have always said it myself: those new blocks of flats sprucing like the plague across the city centre will be a source of social and environmental problems in years to come (issues which have already started to arise in some Manchester developments and elsewhere in the big cities, think the Persimmon development across from London’s Docklands). Negative equity and the credit crunch are putting an end to the grand buy-to-let delusion, while in parallel to this you have fractured communities coexisting side by side in those bland-looking apartment blocks, with no sense of belonging or identity, nobody knowing who the neighbour is, and some unscrupulous tenants attracting unsavoury characters into the buildings (we’ve watched the stories on TV, if not witnessed them ourselves!). A number of these developments already show sure signs of neglect (where do the maintenance charges go?) and – like you – I can predict that those flats will turn into no-go areas before long! These investments tend to be poorly thought out by the architects involved, the style is one step up from your standard council block, the workmanship is shoddy, if not shocking, and those quickly-thrown-together buildings are simply not designed to stand the test of time! Well, after all, the (pre-credit crunch) idea for property developers was to make a quick buck in the nick of time, by maxing out the profits and blighting the landscape! They have certainly succeeded. Some estate agents should be prize winning fiction authors. There’ve been so many new flats put up so quickly that it’s quite shocking to visit Manchester if you don’t come into town very often. The huge township created in Ancoats is amazing… all those new blocks of flats put up and not a corner shop for miles! In Leeds they’re using the empty spaces as allotments and football pitches until the next boom. I really think greassing it all over and allowing it to be green space forever would be a better idea. Many manual labour companies are being forced to close down or be swallowed up by bigger multinationals which is costing many working class citizens their jobs.